Caire Medical, the maker of the powerhouse portable concentrator, the SeQual Eclipse 5, will soon be introducing a new product–the SeQual eQuinox. It has been seven years since SeQual first introduced the Eclipse, and while the Eclipse has been improved numerous times over the years, with the release of three new model numbers, there has never been an attempt to improve the size and weight. Until now. The SeQual eQuinox is expected to be 33% smaller and 23% lighter. 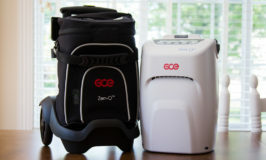 Weighing about 14 pounds, the eQuinox portable concentrator will become the lightest oxygen concentrator to provide up to 3 liters per minute continuous flow oxygen. The eQuinox concentrator will not sacrifice function. It will continue to provide continuous flow up to 3 LPM as well as the current pulse settings of 1-6 and extended settings up to 192 mL. The battery duration will also remain the same, with the added benefit of being front-loaded for easier changing. There will also be a smaller battery option that will reduce the weight to around 12 pounds, but will have a shorter battery duration. A new feature to be included in the SeQual eQuinox may prove beneficial for the visually impaired. The new eQuinox will have an audible display, which will read flow settings and battery levels in a choice of twelve languages. This function may also be put in silent mode. The eQuinox will also have a hide-a-way swivel handle. If you are interested in the SeQual eQuinox and trying to decide if it is worth the wait, the most significant benefit is the reduced size. Compared to the SeQual Eclipse, the eQuinox will be about 4 inches shorter and about 4 pounds lighter. However, you can expect a heftier price tag – $600-$900 more than the selling price of the Eclipse. Caire is expected to unveil the new SeQual eQuinox at the Spring Medtrade Show in early March 2014. Of course, I’ll keep you updated as I learn further developments. My daughter is 13 and has pulmonary fibrosis and is oxygen dependent.I am based in the UK and hoping to travel overseas with my daughter in July 2014.i am trialling the Eclipse sequel 5. find it noisy and cumbersome. Also a bit heavy for my daughter to pull around. I am excited by this new product sequel equinox. is it available in the UK? I am travelling to the US in April. are there any restrictions in buying from the US and transporting to the UK? Do I have to bear any extra costs? Can this product be used with a CPAP device overnight? Thanks for all your valuable suggestions that have been posted! I do not have any information about the eQuinox for the UK. However, it would think it would be available there. If you visit the manufacturer website at http://www.sequal.com you can find the European contact information in the lower left-hand corner of the webpage. I am not aware of any restrictions of purchasing an eQuinox in the U.S. and taking it home with you. The only cost I would think you may have to pay is customs fees. 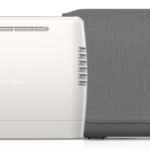 Yes, the eQuinox can be connected to a CPAP when it is in the continuous flow mode. 1. Are there any portable oxygen concentrators that provide even a bit more oxygen than the 192ml pulse setting on the Sequal Eclipse? 2. Are there any others that produce as much and are any lighter? 3. Have you any advice on how to manage the Eclipse and several batteries with only one person accompanying the patient who is in a wheelchair? Is there a wheelchair that would hold the Eclipse? 4. Any further info on the release date for the Equinox? There are no portable concentrators that provide more than 192 mL. The new SeQual eQuinox will provide the same levels of oxygen as the SeQual Eclipse and will weigh about 14 pounds. The eQuinox also has a front-loading battery that would be much easier to access. It appears the eQuinox will be available at the end of March. I think companies are missing a huge target customer base by not producing POC’s that are continual flow above 3.. first man out to get one that provides a cont. flow at say 5 is going to make some big bucks. Most of the POCs out there still have many of us using the carts but it’d be worth it for a CF that provided 5 L. Pulse systems are ok but as some of our diseases progress we need CF and with LOX access being shut down because of govt wanting to save a buck, the only option left are the tanks.. Hurry up companies and get some higher CF POC’s on the racks. Has anyone given feedback on the new SeQual Eclipse Portable concentrator? I need the 6 pulse and 3 LPM, but I also want to be able to take it with me on my scooter. The SeQual Eclipse 5 is too big. I’ve heard mostly good feedback about the new SeQual eQuinox. People who have tried both the Eclipse and the eQuinox prefer the eQuinox. They say it is noticeably quieter and smaller. If the cost isn’t an issue, the eQuinox is a great choice. Be careful with the batteries. The 12-cell battery that comes standard with the unit does not last long; most people purchase a 24-cell battery with their unit. Also, I’ve heard of some software issues. These bugs should have been worked out by now, but be sure to buy from a reputable dealer who will assist you with warranty issues. I am a professional guitarist/singer with Stage IV COPD(emphysema). Dedicated musicians will usually play until they drop. At this point in my life I’m still playing shows. I need a portable for travel both driving and flying. My prescription is 4LPM, however I believe the Sequel 5 may just do the trick for me. During sleep I only need 2LPM continuous flow or 3LPM continuous while seated or driving. I think the 192ML pulse settings would likely work for higher LPM requirements such as walking or playing a couple of shows (as I did last year) at 7,000 ft. altitude. I did fine with my home concentrator set a 4LPM at the gigs and in the hotel. In between I used portable cylinders with 6LPM on demand pulse flow. Carrying all this stuff severely limited the musical equipment and passenger space I could carry in my vehicle plus I can’t fly. I have two questions. Is there a dealer that could provide a trial unit so I could know the thing will do the job for me before I plunk down the bucks to buy? I’m not in a financial position to make a mistake on this one. The eQuinox appeals to me also. Can you give me an idea of the added cost for the eQuinox over the Eclipse 5? I am not aware of a dealer who will let you try before you buy, apart from renting a unit for a week and applying part of the rental fee toward the purchase. However, OxiMedical.com provides a 10-day return policy and you only pay a return shipping fee – they do not charge a restocking fee for returns within 10 days. That’s about as low risk as you can get. The eQuinox is 4 inches shorter and 4 pounds lighter that the Eclipse. For the compact size you can expect to pay about $1200 more. Thank you so much Allison for the speedy and informative reply. Unfortunately, there is no POC currently on the market that will provide continuous flow at 4 LPM. The current maximum flow if 3 LPM. You may want to ask the homecare provider about liquid oxygen, which offers longer lasting time in a smaller tank. Why is the sequal equinox not available anymore after December 2017 as the sequal webpage for the equinox states online. Was it discontinued, recalled what’s the story? To my knowledge, the manufacturer has discontinued the SeQual eQuinox but is still producing units to fulfill outstanding dealer orders.